It’s always exciting when an old favourite takes a new direction. Like donning your favourite t-shirt with some new jeans, or trying your favourite java in a new mug. This month at 3tt, we’re featuring one of our all-time fan favourites with a recent twist, as Vertue Coffee Roasters re-launch a stunning new website and branding. The clean design of their rebrand draws inspiration from the idea of communication. 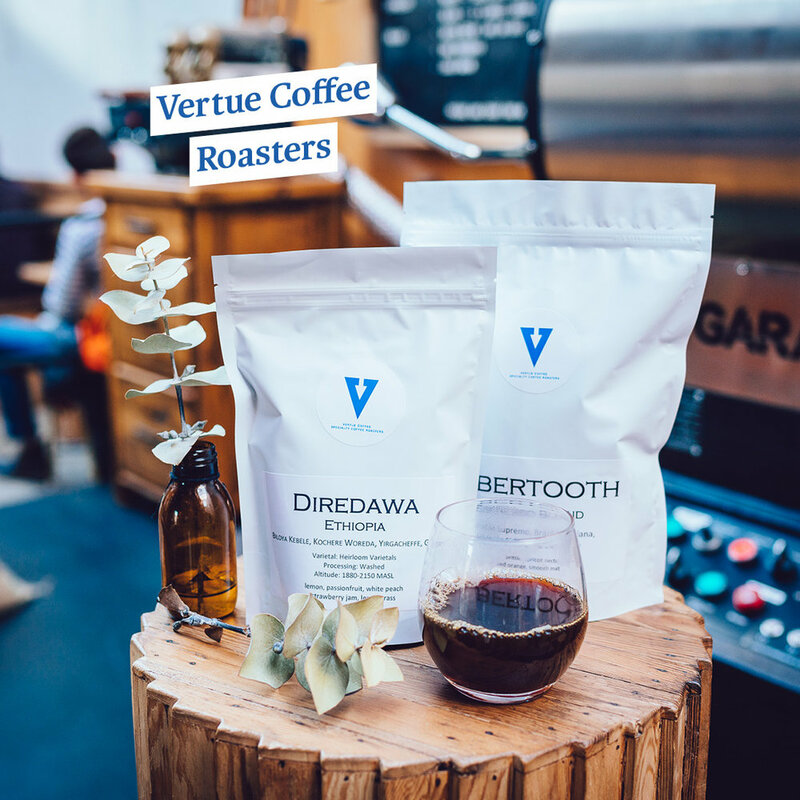 “It’s the same attention to detail as our old branding, while finding a new way to translate our love of coffee to our customers,” explains Mike Cracknell, Vertue’s Managing Director. The new design also cleverly reflects elements of Vertue’s flagship cafe and roastery: such as pops of cobalt blue furniture, set against a clean backdrop of timber and exposed brick. Hidden down a secluded laneway, the Carton venue is a bustling hub for coffee lovers and foodies alike. Originally a horse stable in the 1800s, Mike really has created the perfect, hidden laneway gem. And it’s not just the venue which touches on history. Taking its name from a London handbill written in 1652, “The Vertue [sic] of the Coffee Drink” was the first record of coffee being roasted and sold as medicine. “This handbill outlined the various medicinal and other benefits of drinking coffee,” explains Mike. “We thought it was a pretty great source of inspiration for our name.” With coffee being our daily drug too, we can’t agree more. So it’s no surprise that this month’s coffees will keep you coming back for seconds. The Sabertooth Espresso Blend combines beans from Colombia for balance, Brazil for body and nuttiness, and Ethiopia for floral sweetness, resulting in a subtle stone fruit flavour. For this month’s filter fans, Vertue have the Ethiopia Yirgacheffe Diredawa on offer. This delightful coffee is a classic washed Yirgacheffe, processed at one of Vertue’s favourite wet mills in Kochere, Biloya. You can expect a juicy and complex palate of passionfruit, sweet lemon, white peach and fragrant lemongrass. In addition to the re-brand, there have been other exciting developments since we last featured Vertue back in 2015. After the success of his Carlton venue, Mike teamed up with long-term friend and partner Melissa Hamilton to open a second cafe last year. Inward Goods is a little hole in the wall in Richmond, at 33 Waverley St. “Obviously, this is a different scale than at Vertue, but it still brings an appropriate Vertue experience to the space,” says Mike. So come on a journey with us to discover the new and improved Vertue Coffee Roasters: a fresh take on one of Melbourne’s classic hidden gems. You’ll be a fan in no time. Nestled down a side street in Malmsbury opposite the historic Botanic Gardens is one of Australia’s best kept coffee secrets. This month, we’re taking 3tt members out of the hustle and bustle of Melbourne’s inner-city, to a roastery which brings together coffee, classic bikes and country charm. Located in a small bluestone village in the Macedon Ranges, Motobean is the brainchild of Lachlan Evans, Founder and Creative Director of Coffee. It’s an all-year-round kind of space: with decks overlooking the sweeping gardens, perfect for a cold brew on a hot summer’s day, while in winter the stacked stone fireplaces make for a cosy spot to enjoy a long black. Classic motorcycles dot the cafe space, paying homage to the motorcycle crews and car clubs that cruise the old Calder Highway. Their food offering is fresh and modern, featuring Melbourne-inspired breakfast and lunch menus, boasting quality produce sourced locally and from their own kitchen garden. For this month’s espresso lovers, we have Motobean’s ‘Seasonal Blend’. With a strong focus on overall sweetness, it’s comprised of three micro-lots: Guatemala ‘Jose Poaquil Microlot’, El Salvador ‘El Cerro Microlot’ and a pulped natural lot from Brazil’s ‘Verventes Farm’. The overall result is a velvety, full-bodied coffee that is exceptionally consistent, with notes of caramel, sticky toffee and wild berries. If brewed on a commercial espresso machine, Lachy recommends a 21g dose, 50ml yield over 28 seconds. For the filter fans, we have the stunning ‘Carlos Ferrey’ microlot. Carlos runs the ‘El Recreo’ farm, situated 187km from Jinotega in Nicaragua. This particular natural processed microlot is testament to Carlos’ hard work, featuring flavours of jelly bean sweetness, tropical fruits and toffee. It’s no surprise that Motobean is quickly creating a cult coffee following both locally and internationally. In the near future, they’re focusing on producing more amazing coffees via direct-trade relationships and travels to origin. They’re also planning to create a physical presence in Melbourne in late 2018: watch this space. With stunning views, delicious food and of course incredible coffee, there’s never been a better reason to leave the hustle of the city for some wholesome, caffeinated time in the country. Standing out in Melbourne’s competitive specialty coffee market is no small feat these days. With new roasters popping up regularly, there’s a lot of competition to make coffee that’s not only good, but that blows you away - in terms of origin, design and of course taste. Boasting one of the most stylish aesthetics we’ve ever seen, get ready to be blown away by Wood & Co. Established in 2015 by owner Aaron Wood, the roastery is fast developing a cult following in Melbourne’s inner-North and beyond, featuring in countless venues like Kines, Mile End, Archie’s, Sookie LaLa, Burnside and Premises. Aaron is a Kiwi-turned-Melbournian who grew up playing in punk bands. After scoring his first job in dispatch at Atomic Coffee Roasters in Auckland, New Zealand, he soon rose through the ranks to become Atomic’s Head Roaster. Cut to a few years later, and Aaron moved to Australia to work for Melbourne’s iconic Seven Seeds Coffee, where he honed his skills in green selection, QC and roasting. But the story doesn’t end there. Drawing on his years of coffee expertise, Wood & Co is Aaron’s latest creative venture. Heavily inspired by his years as a touring punk musician, Wood & Co has a low key vibe, while never compromising on quality. “We're a family business dedicated to sourcing and roasting quality coffee. We showcase the coffees we purchase and don’t showcase ourselves. That’s why each coffee has a unique label, but our name remains plain black and white,” explains Aaron. This striking, skater-esq artwork is thanks to local designer Ed Davis, who melds pop culture with inspiration from origin. The result is some very exciting packaging: one of our favourites being “Twin Peaks”, a blend dedicated to the cult TV series. For this month’s espresso lovers we have the Fruit Cake Blend; a sweet, balanced blend of washed Kenyan and natural Ethiopian coffees, featuring notes of cherry, chocolate and toffee. As the name suggests, the Fruit Cake was developed for special occasions, like Christmas, Easter… or even a 3000 Thieves feature! If you’re brewing the Fruit Cake on a commercial espresso machine, try the following recipe: 20g dose, 45ml yield and 93°C water temperature over 25 seconds. For the filter fans, Wood & Co have delivered the gorgeous Gichathaini. The Gichathaini wet mill is one of three washing stations that make up the Gikanda Farmers Cooperative Society in the Mathira West District of Kenya's Nyeri region. This coffee features stunning notes of lush apricot, caramel and Ribena. With some very special micro lots coming later this year (including two Colombian geishas and four washing station lots from Kenya that we’re very excited about), Wood & Co will continue to find and source the best green coffee from around the globe. We have no doubt that you’ll be as blown away by Wood & Co as we are. This roaster is definitely one for EVERY serious coffee lover to watch.